We already knew Frank Ocean would be one of the headliners at the 2017 Sasquatch! festival, and now the rest of the lineup is here. 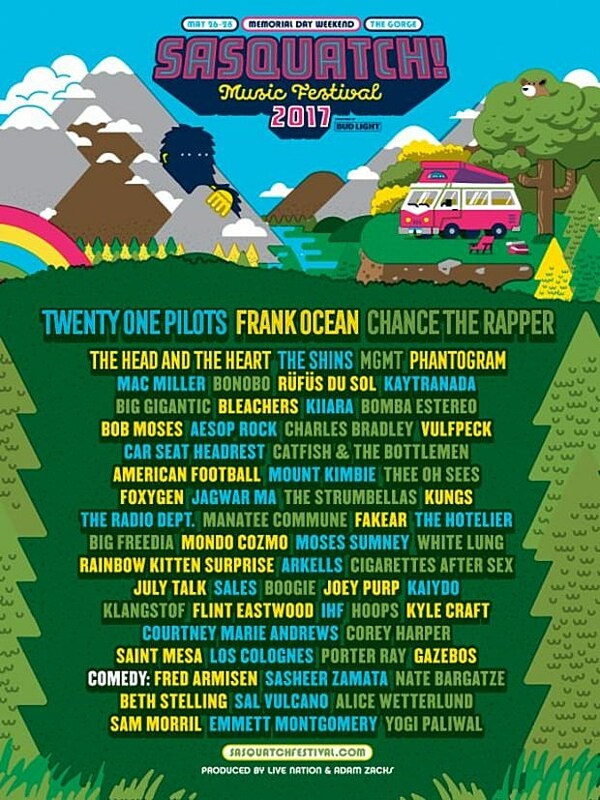 The other headliners are Twenty One Pilots and Chance the Rapper, and the bill also includes The Shins, MGMT, Kaytranada, Aesop Rock, Charles Bradley, Car Seat Headrest, American Football, Mount Kimbie, Thee Oh Sees, Foxygen, The Radio Dept, The Hotelier, Big Freedia, White Lung, Joey Purp, Fred Armisen, and more. Full lineup below. Tickets go on sale Saturday (1/28) at 10 AM.